In my last two newsletters, I talked about the nine tactics of manipulators and how to counter their tactics. If you missed them, they can be found at www.leslievernick.com (look for Archived Newsletters on my Free Resources page). I received many e-mails from readers indicating that they saw themselves as both. They were victims of manipulation as well as manipulators, and they wanted to know how to stop this destructive habit. Manipulators want what they want, and they will go to great lengths to achieve their goals. Often we rationalize that the ends justify the means. But when you regularly manipulate someone, the relationship deteriorates. Even if you got all of your children to comply in coming home for Christmas, they are doing it out of guilt not love, and the underlying feeling is resentment. Is that what you want? All healthy relationships require the freedom to say no to the other without fear or pressure. When freedom is absent and you don’t allow someone to say no to you or have their own opinion on things without making them feel guilty, pressured, afraid, or stupid, then you can’t have a healthy relationship with that person. Part of good emotional, mental and spiritual health is your ability to tolerate the pain and disappointment when someone doesn’t do what you want. No one always gets what they want, even if what they want is good. I encouraged him to invite honest feedback from those who know him well. I suggested he ask work colleagues, other friends, family members and children how they experience him and encourage them to tell the truth without fear of retaliation. Most of them said he was intimidating and controlling. John was flabbergasted. He had no idea. Now what? Once you see you have this tendency to push for your own way, your own agenda and manipulate others to comply, if you want to stop doing it, you must humble yourself and confess this problem. Confess your new found awareness to God and ask people to give you direct feedback when they feel you are being manipulative toward them. Old habits die hard and, even when we want to change, we don’t always recognize what we are doing until it’s already done. When you invite feedback, you are asking people to stop you right in the midst of your manipulative tactics which shows them that you are serious about changing them. Next comes the hardest part. When they give you this feedback, you must stop. You can’t keep pushing, bullying, arguing or guilt tripping. Thank them for their feedback and stop and reflect on your actions. Ask God for his help to see it as well as handle the disappointment of not getting what you want. If we want to stop destructive patterns, we must have other people who can regularly speak into our lives, because the Bible tells us we all have a tendency to lie to ourselves (Hebrews 3:13, Jeremiah 17:9). They will see you sincerely want to change this destructive pattern. Change doesn’t happen overnight with anything. Even though you see something needs to change, the actual changing takes time, practice and persistence. But I promise, if you practice these steps, you can stop being a manipulator and learn to be better friend, spouse, colleague and parent. Question: I know God’s word tells us to forgive, but how do you do it? I try but I still feel angry and bad thoughts come into my head. How do I know when I’ve let it go? Answer: Forgiveness is a decision not a feeling. It’s a choice so the process starts there. You must decide in your heart to work toward forgiving those who have hurt you or sinned against you. Jesus tells us to forgive one another, and that alone is a good enough reason to do it, but forgiveness is a good thing to do even for those who don’t know Jesus or believe in him. Long before modern medicine studied the physiological effects of chronic anger, resentment, and bitterness on the body, God knew that harboring these toxic emotions could not only damage our health but also ruin our lives. He warns us to get rid of them promptly. God knows sin destroys us. It is not the sin that is committed against us that wields the fatal blow. Rather, it is our own sinful reaction to the things that have happened to us. Unresolved anger often turns to depression, self-pity, bitterness, and resentment, and these things poison our body and our soul. A person ﬁnds healing through the process of forgiveness, both receiving forgiveness and extending forgiveness. That is why God is so insistent that we forgive. He doesn’t want sin to ruin our lives. Please don’t misunderstand what forgiveness is. Forgiveness isn’t excusing the offender or minimizing their offense. Forgiveness is your decision to cancel the debt they rightfully owe you. Many protest here and become stuck because they are rightly deserving of justice or an apology or some restitution for the offenses done to them. They don’t want to cancel the debt owed because it feels so unfair to them. Yet if they are waiting for the person to repent or apologize or show remorse, they may wait a very long time. In the Old Testament story, Joseph forgave his brothers for selling him into slavery. Joseph’s obedience freed him to be used by God in Egypt. But Joseph never initiated reconciliation with his betrayers—nor did he expose himself to them when he ﬁrst saw them again. Why? He did not trust them. He was kind and gracious to them because he forgave them, but he tested them to see if they had repented and changed their jealous and self-centered ways. Joseph invited them back into relationship with him after they passed the test (see Genesis 42–46). Joseph’s forgiveness and his brothers’ repentance were both necessary to bring reconciliation and restoration to their relationship. The Friendships of Women Book by Dee Brestin. Plus see the winner of the previous give away! We are currently promoting our Facebook Fan Page and would greatly appreciate your visiting it and “liking” it. While you are there, leave a comment on what you liked about this latest newsletter. 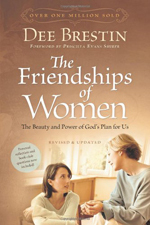 We will be selecting two random winners from all those who comment by 9am Monday, May 20th to receive the book “The Friendships of Women” by Dee Brestin. In the midst of deadlines, car pools, and breakfast dishes, it can be tempting to push aside your longing for intimate friendships. Why add something else to your schedule-and be hurt or disappointed again? Yet it seems that even in the busyness and struggles of life, we cannot ignore our ache to know kindred spirits. This newsletter, we are trying something a little different. To win one of two copies of The Friendships of Women, go to my Facebook Fan Page by 9am Monday May 20th and tell me what you like about this newsletter. Two winners will be chosen at random to receive the free books. Congratulations to Tammi W. of Tampa, FL and Danielle B. of Sierra Vista, AZ winners of the How to Act Right When Your Spouse Acts Wrong Book by Leslie Vernick.